Translating a play - particularly a comedy - into any language is tricky. The translation must not only be understood literally, but also interpreted as the author intended for their own native audience. Starring Griff Rhys Jones, Lee Mack and Mathew Horne, hopes were high in this comedic revival of Molière's The Miser, directed by Sean Foley. 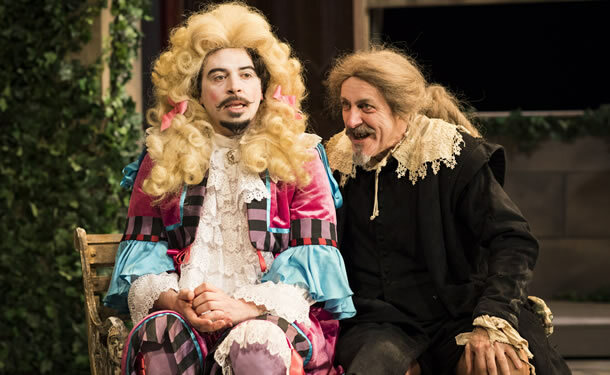 The story itself is a fair interpretation of Molière's original and it does throw in modern references (including Brexit and the budget) to ensure that it is relevant for viewers who have never heard of Molière. But, whatever Foley's intention, this adaptation of The Miser is disappointing. Lee Mack and Griff Rhys Jones play their parts well, but after a while the performances do start to grate and feel repetitive. Funny in places, the overall effect is garish and amateur, more like a pantomime than a comedy. The costume for Harpagon's son Cléante is reminisce of a dame, complete with bunches and a skirt, while the acting is just too over the top and the singing embarrassing at best. This may be the intention, but imitating amateur pantomime in March is never a good idea. Keeping with the panto-esque feel, audience participation is rife, although this seems contrived and not particularly believable. This can also be said about the ad libs - some feel forced as though the audience haven't quite reacted to the previous line as they should. All that said, it isn't the worst comedy in the West End and the surrealism does make it worth staying until the end. But only just.